The national government does not seem to be committed to the Bougainville Peace Agreement (BPA), according to Autonomous Region of Bougainville president, John Momis. Speaking at a sustainability of Bougainville seminar at the Gateway Hotel on Thursday, Momis said the BPA was an agreement between the people of Bougainville and the government of PNG, and should be respected. “So far, we have experienced that the national government doesn’t seem to be committed to the Bougainville Peace Agreement,” he said. “I, as the leader of Bougainville, believe that the people of Bougainville deserve to have a real choice between two comparably attractive options, namely, full autonomy and independence. “If autonomy is perceived as not comparable with independence, then the people have no choice. “It is crucially important at this juncture, when Bougainville stands at the threshold of a new socio-economic order, that the partnership between the national government and the government of Bougainville must be at a level of total commitment and governments working to achieve a common outcome mutually beneficial to both parties. ‘It is difficult for a government which does not have the capacity. ‘Although we do not want to rest on our laurels, before the crisis, Bougainville had the best administration, Bougainville had the best provincial government, and I know because I was the minister for decentralisation. “As well all know, Bougainville and Papua New Guinea must commit themselves to the Bougainville Peace Agreement. Momis said Bougainville was in a situation where it was required to deliver services to reconstruct and to deliver a new system of government. “It is not easy when we don’t have adequate funding,” he said. “Unlike other provinces, we are coming out of the ashes of war, dealing with a society that is highly-divided, which has fallen from being the premier province to Papua New Guinea, to now being at the bottom of the rung of society. They once were on opposite ends of the spectrum, fighting each other in a bloody, decade-long civil war that took away the lives of thousands of people, but on Thursday, former Bougainville Revolutionary Army (BRA) commander James Tanis and former Resistance Forces commander Sam Akoitai pledged to work together for peace and autonomy on Bougainville. In moving presentations at a sustainability of Bougainville seminar at the Gateway Hotel, former guerilla fighter turned Phd student Tanis, and former politician Akoitai, said they were both for a better future for Bougainville. Former Bougainville president Tanis spoke out how the experience of war had changed him, while former Central Bougainville MP and government minister Akoitai, told of the wisdom of late Premier Theodore Miriung, who was assassinated in 1996. Vice-minister for inter-government relations Joseph Sungi, Tanis and Akoitai in discussion at the seminar. “Sam Akoitai and I come from two extremes,” Tanis, now 48 and studying for a PhD, said. “I was from the Bougainville Revolutionary Army and Sam was from the Resistance Forces, the two military groups that fought each other. Tanis said his story was a story of all Bougainvilleans and all Papua New Guineans. “I entered the Bougainville Revolutionary Army not knowing about politics, not knowing about what independence was all about, not knowing much about referendum,” he recalled. “The idea I had as a young fighter was that independence was about guerilla armies overthrowing governments, raising flags, making declarations, and entering the ‘promised land’ after that. “I listened to my leaders, followed their orders and believed in them, but it took me a lot of painful experiences, a few more years, to learn one thing: independence is not all about guerilla armies destroying governments, taking over territories, and making new declarations. Akoitai told of the wisdom of Miriung, when he told him, ‘Sam, you will never make peace when you talk to friends, you only make peace when you talk to your enemies’. “That was the opening for me to start talking to (BRA leaders) James Tanis, Ishmael Toroama, Steven Topesi, and many others,” he said. “That was the turning point for me to go into politics. “It was not easy for the leaders and people of Bougainville, and also the national government, to arrive at what we now see as the Bougainville Peace Agreement. Constitutional lawyer and Bougainville expert, Anthony Regan, says no definite date has been set for a referendum on independence for Bougainville. 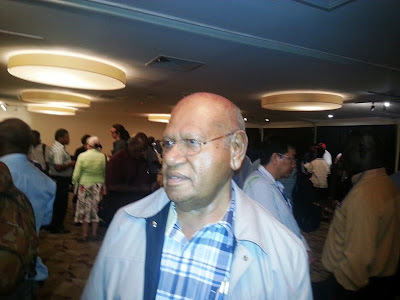 However, a referendum must be held in the five-year period from 2015-2020 as per the Bougainville Peace Agreement (BPA), he told a Bougainville seminar at the Gateway Hotel on Thursday. Regan said there seemed to be a “lot of loss of memory” because of the high turnover on politicians and public servants in Papua New Guinea, and to a lesser extent on Bougainville. “When it comes to things like the referendum, you have people saying the referendum’s going to be held in 2015 or 2016,” he said. “It’s going to be held whenever Bougainville and the national government agree it’s going to be between 2015 and 2020. “In addition, we have a lot of people on Bougainville who say the national government can stop the referendum if it’s not satisfied with weapons disposal, good governance. “Sorry, the national government can’t! “What the agreement says is that the period when the referendum must be held, which is five years from 2015, the date will be set taking into account weapons disposal and good governance. “But it can’t go beyond 2020! The two-day seminar, with theme ‘Sustainability of Bougainville’, is organised by the Port Moresby Bougainville Association and continues today. Generating economic revenue for the future was yesterday’s focus. business houses for their election campaign, according to Registrar of Political Parties Dr Alphonse Gelu. referred to the Ombudsman Commission next Monday over unanswered questions about election funding during the 2012 general elections. “It’s all about them (politicians) informing us about their source, or where they are getting their money from,” Gelu said at a press conference. “This is the most important thing. “In politics, obviously, there’ll be people who are donating money to candidates or contributing. “The Ombudsman Commission is very clear: the limit is K500, 000. “You can’t go above K500,000. “We have heard rumours about some of these people (candidates) getting millions. “That’s totally outside of the law. “We haven’t received any concrete evidence. “Under the Organic Law, business houses or individuals that contribute to a party or an individual candidate also need to fill in forms. “What we try to create is a level playing field for all of those that go in there to compete for their seat in parliament. “But if you look at the way in which money has come in to influence, it’s totally uneven. “There are parties that have more money than others, people flying choppers everywhere, going everywhere in the country. “What we want is for those who hired choppers to tell us where they got the money from. “This is basically the information that we need. “There’s nothing difficult about it. “You don’t need an accountant to tell you how to fill that form. Twenty-three Members of Parliament are walking the tightrope over unanswered questions about election funding during the 2012 general elections. The 23, a motley crew of senior ministers, governors and ordinary MPs, will be referred to the Ombudsman Commission next Monday by the Office of the Registrar of Political Parties. Registrar Alphonse Gelu did not reveal names of the MPs but told reporters yesterday that the leaders had failed to reveal their campaign finances and that amounted to misconduct in office for which they could be dismissed. This is the first time since its inception in 2001 that section 89 of the Organic Law on the Integrity of Political Parties and Candidates has been evoked, the office having failed to have done so in the 2002 and 2007 elections. Repeated attempts by the registry to get MPs to comply since Aug 2012 have fallen on deaf ears, with only 25 doing so by Nov 2012, and the majority doing so this year, Gelu said. The registry wrote to the 23 MPs last month, reminding them of the need to comply with laws, however, did not receive any positive response and was left with no choice but to make the referral. These 23 MPs now owe more than K500, 000 to the government backdated to February this year, from a K2, 000 fine and K20 daily fine after that. “Under the Organic Law (Section 89), it’s a misconduct in office,” Gelu said. “The most-severe one would be losing your seat in parliament, it’s simple as that. “The most-lenient cases would be fines on MPs. Gelu said the need for compliance to Section 89 was to make the issue of campaign finances open and transparent. “As per the Organic Law, the successful candidates need to inform this office on their election expenses, mainly on how they have raised their campaign finances and how they have spent these funds,” he said. “These are part of what we call ‘campaign finances’ and in democracies, the successful candidates and the political parties have to publicly reveal their sources of funding. “In politics, money does play a huge contribution in determining outcomes, especially during the elections. “It is therefore a requirement in our laws that the public must know where the parties and the candidates are receiving their funds from. Gelu said the registry had been so lenient on MPs for the last 12 months but enough was enough. “This is the first time that this has been enforced and we’re trying to give them time, but to me, one year is too long,” he said. A women’s church group from Busamang village in Salamaua, Morobe province, is in Port Moresby on a special mission to raise funds for several projects in their village. Busamang, the largest coastal village in Morobe, is 40 minutes by dinghy from Voco Point in Lae. This idyllic setting is representative of village life in Morobe. Miles and miles of endless white sandy beaches, abundant fishing grounds, thatched roof housing, traditional canoes and subsistence agriculture are an everyday part of life for the villagers. Leaving their scenic village behind, 25 members of the Gabugawe Women’s Group of Busamang are in Port Moresby to exchange gifts with women in the city – a practice known in Morobe as ‘senisim basket’ (exchange of baskets). Last Saturday, they exchanged gifts with women from the city at the home of Busamang couple Rose and Timon Tomala at Gordon, and then engaged in traditional singsing. The group is appealing to Busamang and Morobe residents in the city, as well as leaders, to help them in their fundraising. 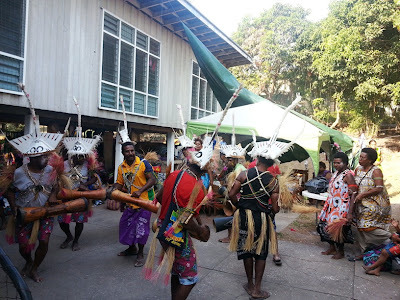 “We are here to raise funds for our projects in Port Moresby,’ Gabugawe president, Banuoc Alaung said..
“There are 38 of us in the group, however, only 25 of us are able to come. “We came here to exchange gifts with mothers in Port Moresby and raise some money. Rose Tomala said for many of the women, it was a first, as they had never before been to Port Moresby. 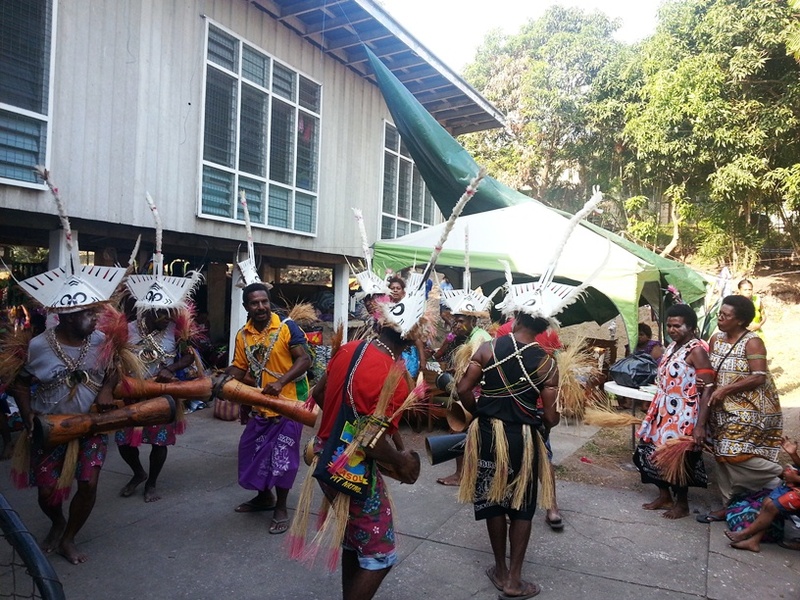 “This is the first time for many of them to come to Port Moresby,” she said.